Is winter finally upon us? After one of the warmest Decembers on record, it seemed that the Missus and my annual “anniversary/birthday” trip to Florida in early January was kind of pointless – especially since during the beginning of that week it was only a few degrees warmer there than it was back in Pennsylvania. But it did get much warmer while we were there and as I sit and write this now at home, it is minus 12 degrees outside with the wind chill factored in. Two interesting meet-ups occurred for me during that vacation. The first came about while I was fishing from the pier where we were staying. While Carol watched me fish (and feeding the non-keepers to the pelicans – George and Ralph), another couple walked out to also fish. During the conversation the ladies were having Carol mentioned that we had “sports cars” and that was another hobby of mine. The gentleman gruffly asked “What kind of sports cars”? Not sure of the possible reaction I tentatively said “MG and Jaguar”. That immediately drew a large smile and “GREAT – at least you didn’t say Triumph”!. Well, that ended the fishing and car talk ensued – particularly Midgets, since both of us own one. That couple was vacationing from the Cleveland, Ohio area. Unfortunately, his wife was considerably less tolerant of “extra” cars than Carol is. The second occurred during our flight home late Saturday evening. Our connecting flight in St. Louis (yeah – Ft. Myers FL, St. Louis, MO, Philadelphia - go figure) was delayed an hour and one-half. To pass the time several passengers were commiserating on their drive-home time from the Philly airport late at night, and in the rain. One young woman said she had about an hour’s drive to south Jersey. I asked where about and she said “Franklinville”. Knowing that was not too far from where I drive my Amish friend several times a month where we sell sheds, barns, gazebos, etc., I said “Oh I go to Berlin several days a month”. And she said “Oh, my mother bought a cherry dining room table and chairs from the Amish outfit at the Farmers’ Market there last fall”. I sold that set of table and chairs – the only one we ever had there………. All of this makes you think about the “six degrees of separation” theory which is the idea that everyone and everything is six or fewer steps away, by way of introduction, from any other person in the world . Huh! Something else struck me at our last club meeting. Several folks were talking about tentative plans to attend the Pittsburgh Vintage Grand Prix this summer. The topic of which hotel to book rooms at came up. Should we go to the “old” place or the one where we went last year? Well that one cost a bit more. But the rooms are nicer, and there is a free breakfast. Well – the higher priced one won out. Not long ago, the LANCO MGers wouldn’t attend a car show if the registration fee was over five dollars and it didn’t include something more than a hot dog. And, of course, we drove our convertible B’s, Midgets, and A’s with the tops down in 95 degree heat and humidity. Now it’s air conditioned Jaguars, Mercedes, Aston Martins, or at least B/GT’s with a/c. Higher cost of the hotel be damned – it has free breakfast! The annual LANCO MG Club Holiday Banquet was held at the Fireside Tavern, Strasburg, PA on Saturday, December 5th, with a large contingent of LANCO members in attendance. 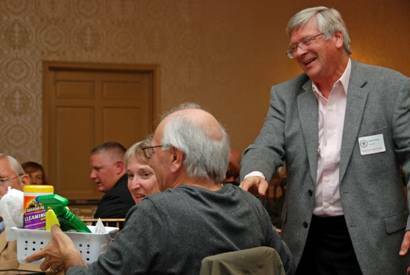 The Central Pennsylvania Food Bank’s Executive Director Joe Arthur and his wife Deb also were in attendance, as were former Lancaster Mayor Charlie Smithgall (of “Cannon Shoot” fame) and his wife Debbie. Banquet dinner choices this year included Chicken and Sausage Baked Penne Pasta, Slow Roasted Braised Beef in Brown Sauce, Broiled Salmon with Dill Sauce, salad, mashed and roasted potatoes and vegetables. For dessert we had cookies, Warm Apple Crisp, and Holiday Bread Pudding – complemented with freshly brewed coffee or hot tea. As the Club did last year, a donation was made to the Central Pennsylvania Food Bank . In October, we also donated to the C4Life Foundation. 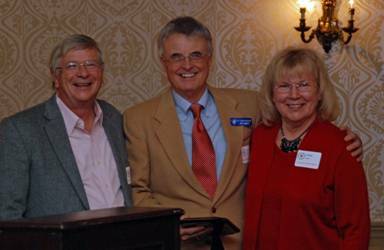 The annual Enthusiast of the Year Award went to Jon and Edie Arndt. 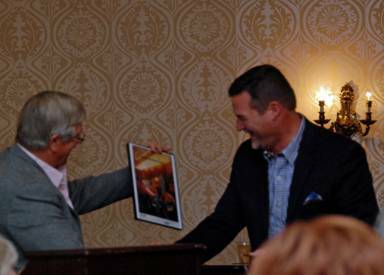 This year’s special awards went to Dennis Blevins (the “Brown Wire Award”) for his adventures with the ’77 B; Trent Bentzel (the “Your Mother Wouldn’t Like It” Award) so he’d have something “MG” to hang in his garage; Gloria Ciaorrocca (the "Hot Headed Founder" Award); and Larry Ciarrocca (the "Avoid Unpaved" Award with GPS/Car cleanup kit) - for when he doesn't! 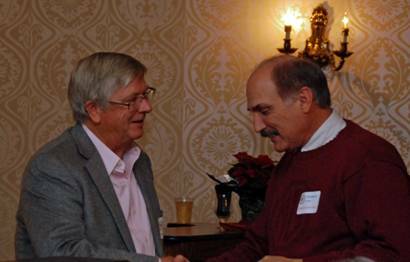 Dennis expressed recognition for last year’s meeting hosts, as well as for the numerous ”A Taste of Britain” and “British Invade Gettysburg” Volunteers, tech session organizers and other Event and Club Volunteers. The festivities concluded with a reading by Joan Martin and the annual carol sing led by Sally, accompanied by Bruce Deisinger. Another enjoyable end to a successful year! 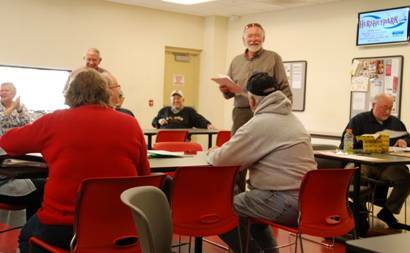 President Dennis Blevins convened the first membership meeting of the new year at the Centerville Diner in Lancaster, with twenty-five members in attendance. One new British Car was also in attendance. Minutes from the November 2015 meeting were distributed. The Treasurer’s report was also presented. The first “Name Tag Drawing” of the year was held – and the selected member (Sandy Williams) was actually in attendance to collect the pot! Most of the discussion during the meeting focused on the scheduling of events for the year. In addition to regularly scheduled Club meetings and events, a joint meeting with the Central Pennsylvania Triumph Club and the Austin Healey Club is proposed in June – to be followed by a “driving tour” of the Gettysburg Battlefield. Several “fun runs” have also been (or will be) scheduled throughout the year. The monthly Coffee – Cars & Conversations get-togethers will commence in April and run through October. It was reported that the flyer and registration form for this year’s British Invade Gettysburg (BIG) Show is almost ready to be placed on the website. This year’s show will be held on Sunday, July 10th. The date of this year’s A Taste of Britain show is Sunday, August 28th. After detailing such an ambitious agenda for the upcoming year, President Dennis adjourned the formal meeting – for food and continued conversation. OK – so I played hooky from the last LANCO MG meeting. I admit it – I wanted to go and have some road rally fun in the snow (more on that later) rather than preside over the monthly meeting. Many thanks to Ralph Spayd for filling in for me there. Several events have been added to the calendar since our January meeting. Here are some of the additions: On April 8 and 9, the New England MG T Register will be hosting the “MG Kimber Festival” in Allentown. This is open to all MG enthusiasts and will include a full day of presentations by various MG experts and personalities. April 28 th will be “Opening Night” for the Lancaster Barnstormers baseball team. As last year, the club has been asked to provide volunteer drivers and their classic cars to parade the team members into the stadium and onto the field. Watch for more information on this from Ralph. The Chesapeake Chapter of the New England T Register will host the “Original British Car Day” at the Lilypons Water Gardens in Adamstown, MD on June 5th. The “British Motorcar Festival” will be held on June 9th through the 12th in Bristol, R.I. This is a sister event to the Stowe, VT British car show held in the fall. Expect the same format and turnout of great cars. Finally, don’t forget that our own monthly “Coffee, Cars, and Conversation” gathering starts up again for the year on April 2nd at 9 a.m. at the Turkey Hill Experience parking lot at routes 30 and 441 in Columbia. Get the dust off of the car and the winter cobwebs out of your head and come out and join the tire kicking and chatter. On a more somber note, many of us are getting to that age (Ahem!!) where our own body parts are wearing out faster than those on our cars. When you know of a fellow member that has become ill or hospitalized, or has passed on the that final garage, please let myself or our secretary Steve Dellinger know so that the Club can pass on “Get Well” wishes (or condolences) to our fellow friends or their families. Back in another lifetime – the early Seventies – we moved from an apartment in Manheim to a village in rural southern Lancaster County. One of the things that caught my fancy then was on many weekend afternoons, dozens of “sports cars” would pass by our house, participating in what I came to find out were “road rallies”. We had our first MG Midget then so I was determined to learn more about these events. I didn’t get very far – just ordering some rule books from the Sports Car Club of America (SCCA). Other than that, I just kept coming up with dead ends – who organized these things, when (and where) was the next one to be held. (Remember – the Internet didn’t exist then, and there was no “LANCO MG Club”!) So, my interest faded away as the family and work responsibility grew. Fast forward about thirty years and we were attending the LANCO MG summer picnic at Sam Lewis State Park. Another member’s wife stood up and said that she would pay anyone $100 to take her place as navigator for her husband on a rally trip. So – opportunity presents itself to those who wait – I was on my way to participate in the “Paddyfork Trials”. 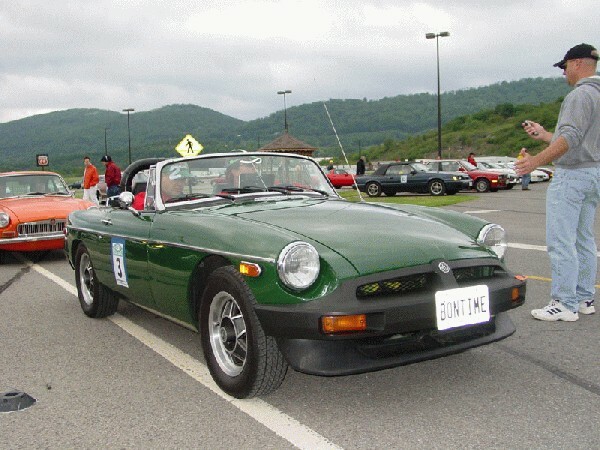 Three rally teams representing the MG’s of Baltimore travelled to central Ohio to compete as a group in a road rally, hill climb, and gymkhana. I was hooked, and Eric Salminen and I became a team, competing in SCCA sanctioned time-speed-distance rallies in Eric’s MGB. After a couple of years of that Eric “upgraded” to a more serious rally car – a four-wheel drive Mitsubishi Gallant. TSD rallies are not “speed” events, but a matter of precision – being “on time, all the time”. You (hopefully) follow a predefined course and predefined ever changing speeds to arrive at checkpoints located at unknown spots along the route. You are to arrive there exactly when the rallymaster has calculated when each car is to be there. Time and speed over distance – simple mathematics. Arriving too early is as bad as arriving late. We competed in SCCA’s “stock” class, using only the speedometer and odometer in the car, a four function calculator, and paper and pencil. And for me as navigator, Dramamine. In 2002, we won the northeast U.S. SCCA Stock class championship. But I was burned out – events were worse than going to work every day and dealing with several hundred computers and their accompanying users. So I took a couple of years off from rallying. 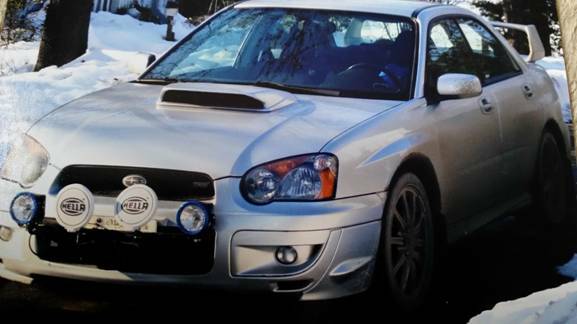 During my leave of absence Eric upgraded again to a Subaru WRX STI and equipped it with an Alpha Elite rally computer. The rally computers are electronically attached to the cars drive line in order to continuously monitor speed and distance. The operator (navigator) inputs time of day for the start and required speed changes, delays, etc. during the route via buttons and switches and the computer constantly computes and displays the time difference between the prescribed route and your actual performance. I was back in the game. So easy a trained monkey can do it. However, this pushed us up into SCCA’s “equipped” class where we would be competing against national championship teams – those that win 250 mile rallies with 16 checkpoints with an overall error (score) of ten hundredths of a minute or less! Tough competition for newbies like us. Only way to level the playing field was to run against them where road conditions help define the outcome. Which brings us to – Winter Rallies! The weekend of February 6th and 7th was set for the fiftieth running of the Ohio Winter Rally. Eric and I do a few of the Finger Lakes SCCA Region winter rallies every year but had never made it to this historic event in northeast Ohio. 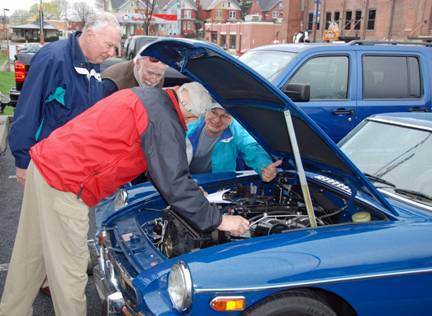 It looked like it was out again for us this year, being the 7th was the date for the LANCO MG Club meeting. However, Ralph Spayd graciously stepped in to preside over the meeting and let me off the hook. Eric and I left early Saturday morning so we could make the 2:00 p.m. registration near Cleveland on time. Passing northwest of Harrisburg we noticed – no snow! Oh well, Cleveland to Erie, PA always has lake-effect snow coverage. Not this year – the 150 mile rally route was mostly dusty, but sometimes muddy, dirt roads. From 4 p.m. to close to 10:00 we ran against some of those national teams and ended with 32 points (32 hundredths of a minute off). One of our best outings ever, but only good enough for sixth place. Aside from the temperature, might as well been summertime! I did learn one thing – the Ohio Amish had their laws rescinded that require them to have those orange and red safety triangles and flashing lights on their buggies – and their buggies are black! An added night hazard… After a late dinner, scoring, and awards around midnight, it was time for a night’s sleep at the hotel, breakfast and the drive home Sunday (and no snow until Harrisburg and south!). A thousand mile car weekend for the possibility of winning a pair of engraved glass mugs - Yep – certified “car nuts”. 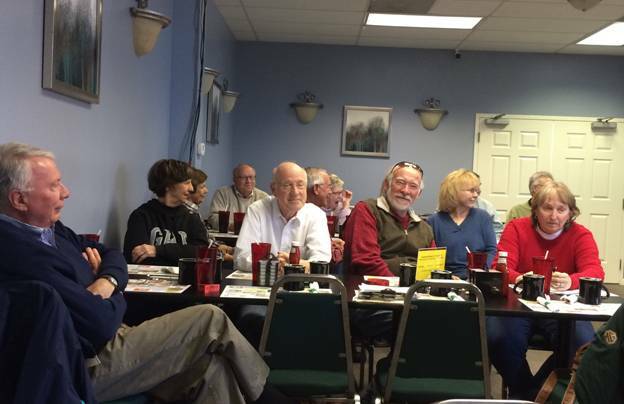 In President Blevins’ absence, Ralph Spayd convened the second membership meeting of the New Year at the Centerville Diner in Lancaster, with eighteen members (and one prospective member) in attendance. Three “new” British Cars were also in attendance. Minutes from the January 2016 meeting were distributed. The Treasurer’s report was also presented. The second “Name Tag Drawing” of the year was held. However, the selected member, Dale Glatfelter, was not actually in attendance to collect the pot – so it will roll over until next month’s drawing. As it was Super Bowl Sunday, the Agenda was abbreviated. Most of the discussion during the meeting focused on upcoming and potential events for the year. The Calendar of Events was distributed to those who had not received a copy at the previous month’s meeting. Some events discussed (that are not on the Club Calendar) included the Kimber Festival (at the America On Wheels Museum in Allentown – April 8-10); the Original British Car Day at Lilypons in Adamstown, Maryland on June 5th; and the 2nd British Motorcar Festival in Bristol, Rhode Island – June 9-12. The Triumph Rescue’s Tech Session was also mentioned – which usually occurs sometime in March. 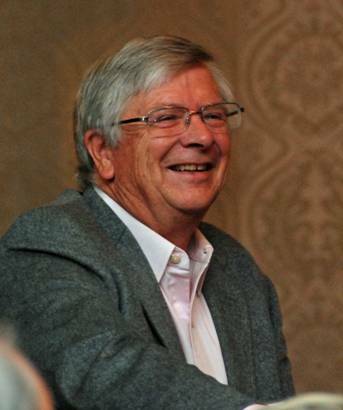 Ralph Spayd floated the idea of a group trip to the United Kingdom in the Spring of 2018. As there appeared to be some interest, Ralph volunteered to do some preliminary investigation/planning. It was noted that a Board of Directors Meeting is scheduled for February 18th. Updated criteria for the Enthusiast of the Year Award will be one of the topics discussed at the Board Meeting. 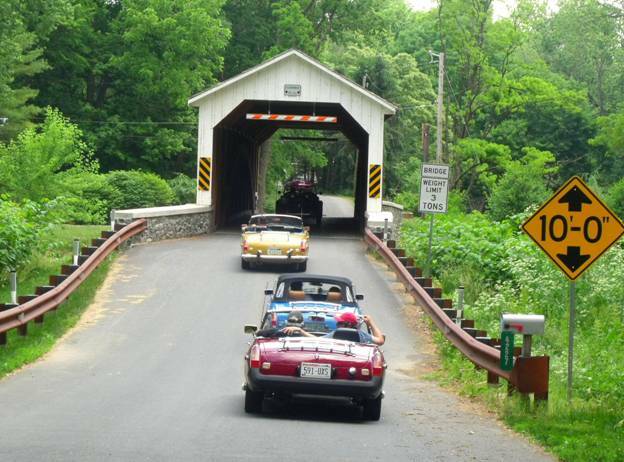 Sunday, May 22 – LANCO MG "Covered Bridge Tour" Details to follow. Ah, March; for me, the most frustrating month of the year. Winter is not entirely ready to let go of raw, wet, dank days but those are also interspersed with some bright and sunny warm ones. Given any slight reason, one gets anxious to get the car out for a short drive – a quick pop to the hardware store, go top off the tank at the local station that still serves up non-ethanol gas, even volunteer for a grocery shopping run (Bleah!!). A brace of Corvettes or a restored ’57 Chevy passes by on the road outside. Even the noticeably increased motorcycle activity fans the embers. Whatever the cause, first and foremost, take the time to check all the systems out on that car that’s been sleeping since last Fall BEFORE heading out on those first runs. Once on the road, listen for, and be aware of, things that don’t sound or feel quite the same as you remember. Now’s the time to get everything in shape for that driving season that’s just around the corner. On the other hand, there are some folks like our newest member. Marc Roland is relocating to the Lancaster area from the Philadelphia suburban area. 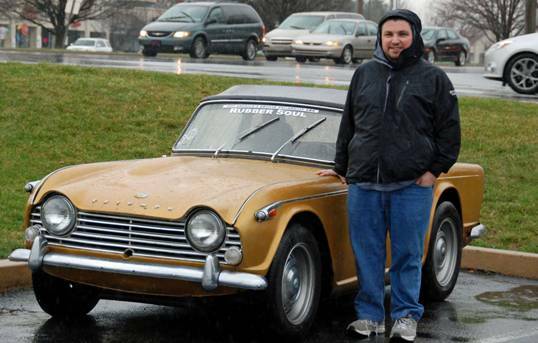 He attended our March meeting from Glenside, driving his ’65 TR4-A. No garage queen here, Marc says he drives it all year ‘round – warts and all. I don’t know about that – it was great to see it out in the restaurant parking lot amongst all of our SUV’s on that continual rainy day. An enthusiastic, out-going fellow – Welcome, Marc! Whether an occasional pleasure trip or a daily driver, whatever your approach…………. How is the "MG Enthusiast of the Year Chosen??? 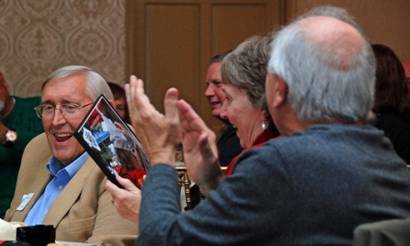 For those of you that attend our annual Holiday banquet, you know that each year the club presents an “Enthusiast of the Year” award to one of our members. If you always wanted to know how the “enthusiast” is chosen (and never asked this question), here is the answer! The Secretary keeps records based on the criteria outlined in the following "Participation Points Chart”. These records are maintained from January 1 through November 1, after which points are totaled and the winner is determined. If there is a tie or a close total of points, a 1st and a runner-up may be chosen. Every member is eligible for this award - the only requirement is that you participate in the various meetings, events, shows, etc. If an attendance list is circulated at an event or meeting, that is proof enough! We’ve just added a couple of items to bring us into the 21st century but still recognize participation in LANCO MG activities. If you attend a show not mentioned at a club meeting or in the British Marque newsletter article, let us know - we want to include everyone! The Secretary will keep a record of points earned by club members each year to the best extent possible. Members are encouraged to keep their own records and inform the Secretary of non-club organized items. It is the responsibility of an event’s chairperson, organizer or rally master to report their helpers to the Secretary. Members who attend another car show must notify the contact person, or if there is none, notify the Secretary. It is each member’s responsibility to sign the attendance sheet and indicate whether he/she drove a British vehicle to club meetings, etc. No Enthusiast of the Year can win within 4 years of last win. Ties will be broken by a determination from the Board of Directors. LANCO Member Car Makes the Cover! LANCO members Tony and Rose Ann Sinkosky have been informed that MGA! 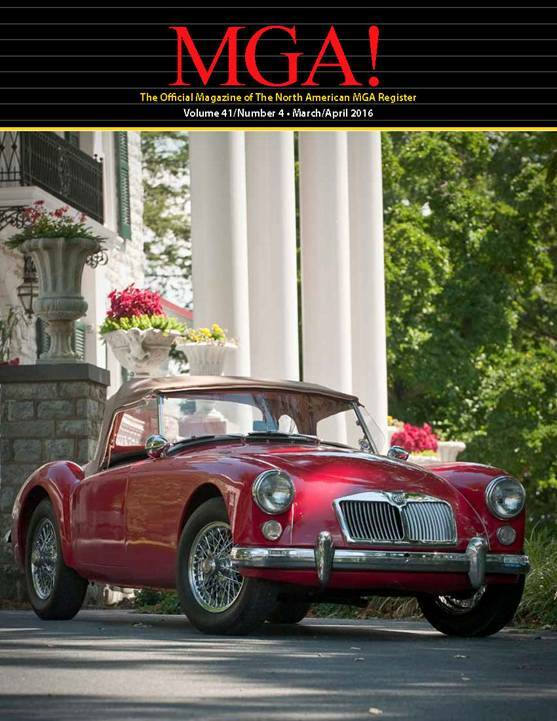 Magazine is running an image Tony shot of their ‘61 MGA 1600 for their March/April cover. Tony, who is a photography professional, did the shoot at High Point Mansion – Milton S. Hershey's residence - in Hershey two years ago. 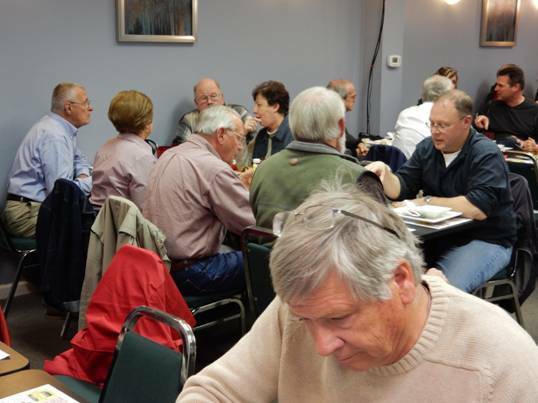 President Blevins convened the third membership meeting of the New Year at the Centerville Diner in Lancaster, with thirty-five members in attendance. Four British Cars were also in attendance. Minutes from the February 2016 meeting were distributed. The Treasurer’s report was also presented. The third “Name Tag Drawing” of the year was held. However, the selected member, David Schultze, was not in attendance to collect the pot – so it will roll over until next month’s drawing. It was noted that a Board of Directors Meeting was held on February 18th. Updated criteria for the Enthusiast of the Year Award were one of the topics discussed and agreed upon at the Meeting. Arrangements for the British Invade Gettysburg and A Taste of Britain shows were also discussed. Upcoming events discussed included the kickoff of the Coffee, Cars and Conversation on April 2nd; Triumph Rescue’s Tech Session (in Bally) and the Kimber Festival (at the America On Wheels Museum) in Allentown – both on April 9th; opening day at the Lancaster Barnstormers on April 28th; and the Tech Sessions at European Imports/LEPCO on May 15th. Last month when grousing about March’s weather, I was basically trying to get the message “Don’t worry, warm spring days will be here soon” across. Well – a full day of measurable snow in mid-April and multiple nights of sub-freezing temperatures? Come on, Mother Nature, enough already! Of course, we can’t do anything about it, so just grin and bear it. Keep cleaning the garage and taking care of those little odd jobs on your car so when the weather finally does break you’ll be ready for the driving season. Soon enough we’ll be complaining about the mid-Atlantic’s three H’s – HAZY, HOT, and HUMID. And those are one of the main reasons that some of us of a certain age (ahem!) have been “upgrading” to more comfortable “sports” cars with climate control and wider doors! And that leads into a topic that has come up before – as the vast majority of the participants in our efforts to collect, restore, and enjoy our “little British cars, what will become of our “hobby” as we continue to age? I thought about this off and on before but only in fleeting. Now, with unexpected falls, cataract surgeries, hospital stays, and compatriots starting to show up in the obituary columns it’s a bit more serious. Even the old stalwart in Central Pennsylvania – “Import Carlisle” – has become “Carlisle Import and Performance Nationals” this year. Really? Can you envision Scion tCs or Honda Civics with number 10 tin cans for “mufflers” being the collector cars of the future? Understandably, Carlisle Events is in business to turn a profit and has to go with the flow and follow the money. Some people like Rap “music”, too. Just call me old. So, what to do? Take a kid – grandchild, nephew, niece (girls like cars, too! ), or neighbor along. Bring them out to a car show. Maybe have them help on a small job in the garage. (A “fetch” is always handy to have around and they can learn what a wrench or screwdriver is used for or why there are oil filters and gaskets.) “Drive your British Car Week” is coming up on May 28th through June 5th. Get your LBC out of the garage and drive it – really – it won’t turn into a pumpkin when you leave your own zip code. It’s not a museum piece that is never meant to move with some parts made out of paper Mache (true story – for another time). Get it out and have it be seen, and above all ……. It final happened, we kicked off the 2016 season with our April CCC. I have to admit that during this past winter and whilst enduring our “epic” snow storm I wasn’t sure we would actually see spring again or even the ground. It was an unusual start in that in rained! I believe this is our 3rd season and we’ve been virtually rain free for all the meetings. I hope I didn’t just jinx the season…The first meeting is always a challenge as it’s early e.g. the 1st Saturday of the month and this year it was April 2nd. So the cars may or may not be ready. But in most cases, the cars are fine; it’s the drivers that aren’t quite ready. We had 5 stout members attending but only one true believer. Brooks Thompson drove his 1974 MGB GT and was the only “real” British driver to attend. The weather was quite British and should have been fine for the cars. But I like my other 3 cohorts, found that delay wipers, a defroster and heater offered a much more appealing alternative. Shame on us, can you forgive us Brooks, we are not worthy!!!!! Oh BTW, Brooks had trouble starting his car, but did get it going and was heard to say as he drove off, “hummm never did that before”. Personally, I could barely hear him over the drone of my heater fan and the XM satellite radio. Which brings me to the May 7th Coffee Cars & Conversation gathering. 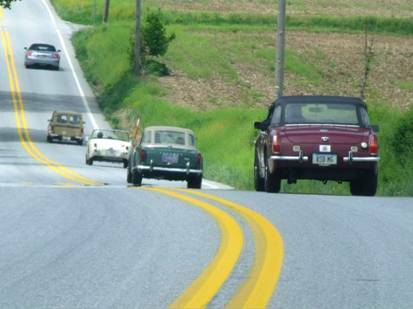 We’ll be hosting a joint event with our friends from the Central PA Triumph Club and the Austin Healy Club. We’ll meet at 9 AM for our usual BS (British Speaking) and problem solving session. Then at 10 AM we’ll gather for a river run and tour and finish up at the Moon Dancer Winery in Wrightsville for some lunch, beverage and continued British Speaking! There will be no excuses for not driving your car in May, but if you can’t please join us anyway for some good scenery, lunch and friendship. Remember to check out our web site at www.lancomgclub.com and mark your calendars for the upcoming events. We have some really exciting events planned for 2016. WOW, each spring Matt Bakes and his staff host a first class tech session at his shop in Bally, PA. This year the topic could have been on snow blower maintenance as it was snowing with wild abandon. The good news was a snow storm on April 9th doesn’t stick to the roads, but sure looked impressive at times. We had two members from LANCO attending the session. Mike Williams joined me and wisely suggested we stick to the main roads for the trip from Lancaster. Good call Mike! If you’ve never been to TR Rescue’s tech session you’re missing an impressive event. The info is always timely, informative and most importantly practical stuff you can use. The Q&A’s are great and cover a wide range of subjects. When you reflect back and consider the issues we have with modern oils, antifreeze and ethanol gas we’re all lucky to be keeping our cars running. I’ve personally used the services of TR Rescue and can attest to the quality of their work. Walking around their shop before and after the session gives you a good idea of the breadth of their capabilities. Like past years we were treated to a great lunch and I met some really great enthusiasts. The common bond we all share makes this a very worthwhile event and I look forward to it each year. Thanks Matt and crew for another fine tech session. Hmmm…next year maybe something on snow tires???? 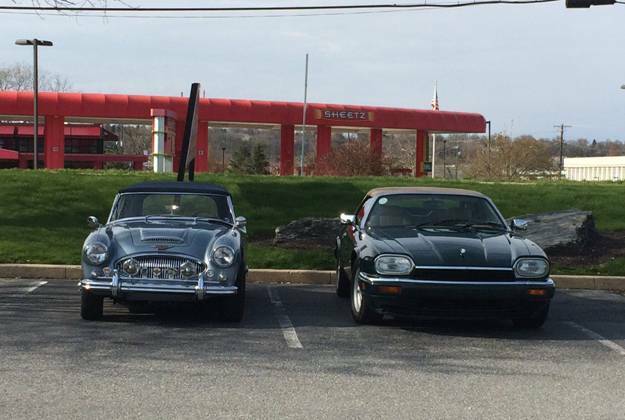 Come Join the LANCO MG Club on a Covered Bridge Road Trip! Once again, we will be doing a Covered Bridge Tour. The event is scheduled for Sunday, May 22nd – with a starting time of 1:30 PM ( a drivers meeting will be held at 1:15 in the parking lot). British Cars not required!! The starting point has yet to be determined (check the LANCO website www.lancomgclub.com for updates). Driving time will be approximately 90 minutes, with stops for pictures at the bridges, and with a driving distance of a pproximately 25 miles. Detailed directions will be available the day of the event and no major highway driving required on the route. We’ll also post the directions on the LANCO website. We’ll tour the back roads of Lancaster County and see five historic covered bridges: Forry’s Mill – Siegrist’s Mill – Schenck’s Mill – Kauffman’s Distillery Bridge – Shearer’s . If you can’t join the tour, just meet us at the General Sutter Inn/Bulls Head Tavern ( 14 East Main Street in Lititz) at 3 PM f or some British food and drink (parking behind the Tavern). 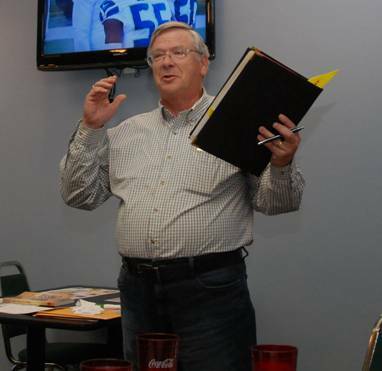 President Blevins convened the fourth membership meeting of the New Year at the Centerville Diner in Lancaster, with twenty-four members in attendance. The weather was cold, but nice enough to have four British Cars in attendance. Minutes from the March 2016 meeting were distributed. The Treasurer’s report was also presented. The fourth “Name Tag Drawing” of the year was held. However, the selected member, Michael Swift, was not in attendance to collect the pot – so it will roll over until next month’s drawing. 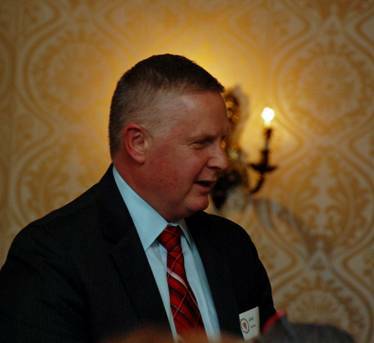 Upcoming events discussed included opening day at the Lancaster Barnstormers on April 28th; the Tech Sessions at European Imports/LEPCO on May 15th; Import Carlisle on May 21st; the Covered Bridge Tour on May 22nd; and the Club Meeting/Gettysburg Battlefield Tour on June 5th. Arrangements for the British Invade Gettysburg and A Taste of Britain shows were also discussed. Then the season really takes off for the rest of the summer. The rest of June holds the June “CCC” and June meeting in conjunction with a driving tour of the Gettysburg battlefield, the show in Hellertown, PA and the “Original British Car Day” at Lilypons in Maryland. In between there’s the all-MG-registers’ “MG2016” in Louisville, Kentucky. A contingent of LANCO MGer’s will be heading out for that big event. Unfortunately, Carol and I won’t be along for that one. We just attended a niece’s wedding in Ellijay, Georgia, Twelve hours down and thirteen hours back was more than enough highway time for a while and family trumps all! However, we did stay at a remarkable Inn on the summit of Fort Mountain along Highway 52 between Chatsworth and Ellijay – panoramic views of the wooded northwest Georgia mountains for miles and miles. GA-52 covers twenty-five miles between those two towns, ascending and then descending the mountain with ninety-seven turns. Oh, to have had a sports car there. Maybe another time. Well, at most of our monthly CCC gatherings we do have “whine”, but this one was different. It started with coffee, but ended on a very pleasant note. First, thanks to Gloria and Larry for planning a beautiful Susquehanna River drive. Well done! We hold our CCC gatherings on the first Saturday of the month from April thru October, meeting at the Turkey Hill Experience in Columbia, PA. As we had the date planned we decided to expand the May gathering to include a river run and ending at the Moon Dancer Winery in Wrightsville, PA. As has been the case this year (hope it’s not a trend) the weather was iffy! But we persevered and hung in there till 10:30 AM with no rain. Some of the CCC group left and others filtered in for the event. We had seven cars and as an MG club we were in the minority, outshined by the Austin Healeys. Eleven brave individuals set off on a 52 mile jaunt through Lancaster and York Counties. 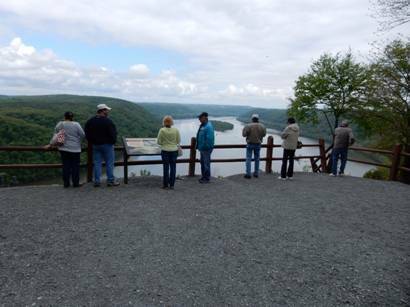 The scenery was spectacular with a stop at Pinnacle overlook to view the Susquehanna River. We made an unplanned stop at a park “porta potty” for someone…..but in his defense, everyone seemed to enjoy the break, as we did drink a bunch of coffee earlier that morning! Beside the twisty roads and scenery, we did enjoy a surprise bike race in the middle of the route. We were all worried that Victor’s Bugeye would be passed by the bikes but he got em’ going downhill…..Besides the MG’s, AH’s and Triumphs in the group we were wowed by Margaret’s rental car. It was quite the eclectic mix of motor vehicles. Not to be left out of the mix, I drove my Audi, as I’m still working on my MG, yah, that’s it, I’m still working on my car. This was our 1st joint event of the year with the Austin Healey Club and CPTC. We hope to have several other events this year with all three clubs. 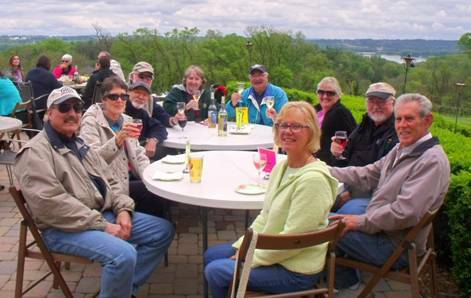 We did finish at the Moon Dancer Winery and enjoyed some good conversation, food and wine. What a winning combination. The view at the Winery is spectacular with a great overlook of the river. But getting there is not half the fun. I believe their access road was designed and maintained by PENNDOT. As a side note, we did find a very effective new member recruiting tool. Came in a bottle, tasted good and helped us to sign up Victor. Now he’s one of us…ha, ha, ha!!!!! Liz from the Lancaster Barnstormers, the Lancaster minor league baseball team, asked for our help with Opening Day. 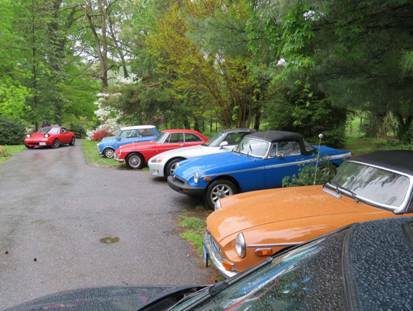 The LANCO MG Club, for the second year, was invited to supply the convertibles for their Opening Day celebration. Last year we supplied about 20 convertibles for the ceremony. This year was something different and they only wanted older classic or antique cars, nothing modern! They were featuring Chubby Checker that evening and wanted to set the world’s record for the most people doing the "Twist" simultaneously. So oldies, but goodies it was! 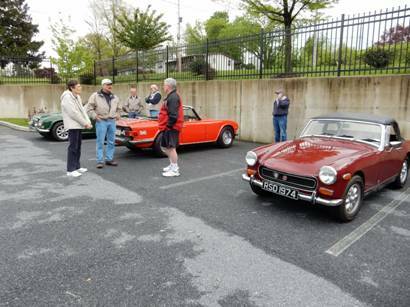 I put the call out to the club and also invited our friends from the Austin Healey Club and the Central PA Triumph Club. The process would be the same as last year. We’ll line up on Clay Street, enter via the right field gate, pick up our player to chauffer around the infield and drop them off at home plate. It’s a real treat to drive your car around the ballpark infield with the players and all the fans hollering and waving. Our numbers started small, but grew as word spread. We wound up with about 18 British cars to help shuttle the players. The Monday before the game, we had a “walk thru” at the ballpark to go over specifics. It was a sunny afternoon, but cool. Liz explained the process and gave me 40 tickets to pass out to our volunteers. The stage was set for Thursday nights extravaganza, It was gonna be a good one. Well, it rained Thursday and the track was too wet to drive on and we were cancelled. The game went on as scheduled and the Barnstormers lost, but did set a world’s twist record. Lots of disappointment within the club, but hey - stuff happens. What’s the moral of the story? LANCO has made a strong connection with our local baseball team. In fact, they think of us first when they need convertibles. What a great way to show off our cars and expose lots of spectators to our hobby. We offered another opportunity for the three car clubs to work together and mutually enjoy our cars. Finally, we had an opportunity to do something unique with our cars, not the usual car show, cruise, etc. We can’t change the weather, but we can change what we do with our cars and how we expose the public to our hobby. These opportunities don’t just happen - you have to make them happen. Look in your community to see what connections you can make. What unique opportunities might exist? What new connections can you make? Sometimes you plan and it doesn’t work out, but don’t stop planning. When it all comes together it’s a thing of beauty! Now if only Lancaster had a dome stadium…… hummmmm! The MGs of Baltimore held the twenty-seventh annual running of the “Get the Dust Off” rally on Sunday, May 1st. The event was sanctioned by the Washington, DC region of the Sports Car Club of America. 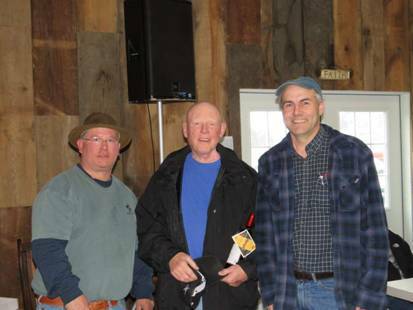 As has been the case in the past several years, the event started at Eric and Mary Salminen’s “farm” in Kingsville, MD and finished at the Dejon Vineyards and Winery in Hydes, MD. The sixty-file mile rally route covered scenic country roads in northern Baltimore County and Harford County, MD and even touched briefly into southern York County, PA. There were forty-seven checkpoints in the “Monte Carlo” route but just fifteen were manned and scored. In a Monte Carlo rally the instructions tell the competitors where the checkpoints are and the perfect time to be at each one, the trick is they don’t know which ones will count toward their total score. Thirty-six teams registered for the event and included cars from a 1955 MG TF through a 2016 Mini Clubman, plus everything in between. Possibly because of the rainy weather, only six of our “little British cars” turned out for the event. Competition classes were provided for the standard SCCA groupings – equipped, limited, stock, and novice – plus “Vintage” (prior to 1960), “Historic 1” (1960’s), and “Historic 2” (1970’s and early 1980’s). There was also a “seat of the pants” class provided for those inclined toward “let’s not get too serious about this and have fun”. Eric Salminen and Dennis Blevins served as rallymasters. LANCO MG’s Richard Barnes with navigator Michael Reick competed in the large novice class of fourteen teams and finished fourth in that class (261 points). Alan and Carol Tucker competed in the “Stock” class in Carol’s 1993 Volvo 245 and finished second in that class with a total of 227 points. Bruce Bubeck served as the “official” photographer for the event as well as helping to man two checkpoints. 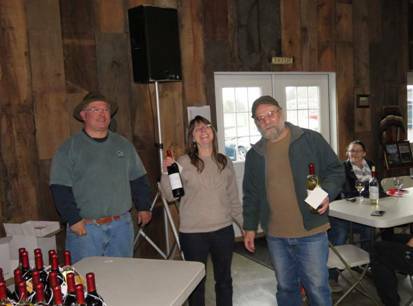 While the scores were being tabulated at the winery finish the competitors were swapping tales (or lies) of their day’s adventures, checking their door-prize tickets for winners, and participating in the wine tasting which was included in their rally entrance fee. Bottles of Dijon’s wine were awarded to the first, second, and third (and sometimes fourth) place finishers in each class. Due to the number of classes and participating teams, over thirty bottles of wine were handed out. A novice team finished with the lowest score of the day (90). Therefore, they not only received the first place award for that class but were also presented with a gift certificate provided by the Winery for a complementary private wine tasting party for twenty people. A GOOD time was had by all. I lost count but think it was our 6th annual tech session at Tom Hertzog’s European Imports in Maytown, PA. We had a great turnout with 17 people soaking up the info and ideas. Tom does an excellent job and always asks us what we’d like to discuss. We all stare at Tom with blank eyes and let him pick the topic! This year was a good one and centered on getting your car ready for road trips. Tom is a very big proponent of driving your car and being prepared for the expected unexpected (I took poetic license with that one). We plan for 90 minutes and the time just flies by with lots of info. The Q&A is always good and generates lots of comments. We were cautioned to not assume new parts are correct. Take a minute and verify what you have is what you need AND that it functions as described. Tom presented some great ideas on how and what you might need to fix a broken accelerator cable. The ideas centered on getting you back on the road safely and quickly until you can get a more permanent fix in place. We had a hands on demonstration of a self-fusing silicone tape (X-Treme Tape) used to fix leaks, tears, etc. The tape works by wrapping and stretching it on itself. It holds well in both wet/dry situations. Antifreeze was somewhat problematic, but with some drying and cleaning worked well. We got some really good tips on what tools and “stuff” to pack to help keep you on the road. Thanks again to Tom for another session well done. After the tech session we adjourned to LEPCO to regroup with the other tech session. We run both a car and non-car session simultaneously. 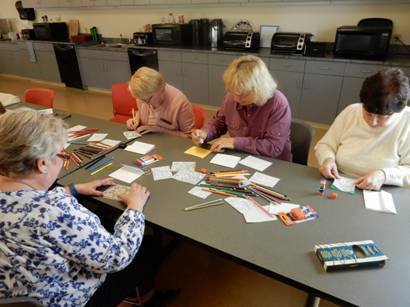 The non-car session had 10 people working on crafts. The LANCO Ladies "colored and pasted" for their Tech Session. After coloring the picture, they made a greeting card out of it. They found the coloring to be very relaxing! The music was a real hit! Thanks to Sue Hurley (and Sally) for organizing the event. Also, thanks to Tim Martin for allowing us the use of LEPCO for our meeting. It’s a great venue and very convenient for our sessions. We stayed on site this year at LEPCO and enjoyed pizza, drinks and desert. Maybe we need to do a tech session on dietary guidelines……….nah, but we might want to check tire pressure after the next session! In the President’s absence, Ralph Spayd convened the fifth membership meeting of the New Year at the LEPCO facility in Marietta, with twenty-seven members in attendance. The weather was cool, but nice enough to have eight British Cars in attendance. Minutes from the April 2016 meeting were distributed. The Treasurer’s report was also presented. The fifth “Name Tag Drawing” of the year was held. However, the selected member, Jeff Simmons, was not in attendance to collect the pot – so it will roll over until next month’s drawing. 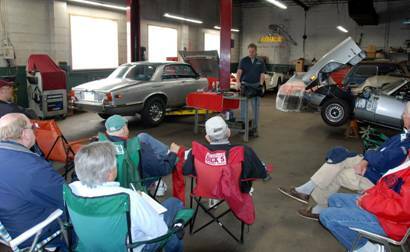 Upcoming events discussed included Import Carlisle on May 21 st; the Covered Bridge Tour on May 22 nd; and the Club Meeting/Gettysburg Battlefield Tour on June 5 th, as well as the trip to MG2016 in Kentucky in June and the Pittsburgh Vintage Grand Prix in July. Arrangements for the British Invade Gettysburg and A Taste of Britain shows were also discussed. Our own Skip Partlow has agreed to lead the tour. This will be the “condensed” version of a tour with general highlights. Skip is willing to do a more in-depth tour at a later date for those interested. This will be a “top down” tour so bring your binoculars, sun screen, hat and water. Skip will supply handouts before starting.